Anabelle Pomeroy's parents were out of town on Sunday, but that didn't stop the 14-year-old girl from attending Sunday services at the First Baptist Church in Sutherland Springs, Texas. After all, she was the pastor's daughter. And when a man dressed in black with a tactical vest and an assault rifle burst into the church and started shooting, Pomeroy was one of 26 people to be killed, "along with many friends," according to Sherri Pomeroy, Anabelle's mother and wife of Pastor Frank Pomeroy. 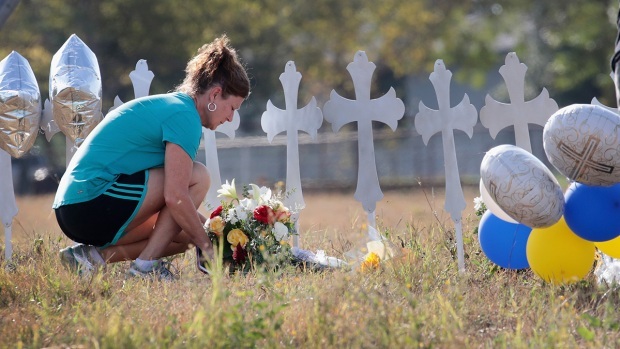 The shooting devastated the close-knit community in the small, rural Texas town, near San Antonio. "It's something we all say doesn't happen in small communities," Wilson County Sheriff Joe Tackitt said. "We found out today it does." Officials released few details about the identities of the 26 victims, beyond that they ranged from ages 18 months to 77 years. Most of the victims died in the church, while two were killed outside and one more died in the hospital. But some family members have started to talk about loved ones who were killed. Sherri Pomeroy and her husband were in different states when the gunfire began, she told NBC News in a statement sent from the Charlotte airport, where she was trying to get a flight home. "Frank and I will both be home in a few hours with the rest of our family," she said. "Thank you all for your love and support as Frank has to deal with our loss personally and is already being sought out by every media station across the country. Please know we love you all and we will be unplugging for a time." Sandy Ward said that four of her seven grandchildren were inside the church, along with their mother. One of her grandchildren was shot four times and was in surgery for hours on Sunday afternoon. Another, 7-year-old Emily Ward, did not survive the shooting. "That church is just like family," said Sandy Ward, a longtime member of the church. "It's like losing several members of your family." Local and federal law enforcement swarmed the community and blocked off access to the church hours after residents reported hearing gunfire. Regina Rodriguez walked up to the police barricade a few hours after the shooting and hugged a person she was with. Her father, 51-year-old Richard Rodriguez, attends the church "every Sunday." She had not yet been able to reach him, saying she feared that she had "just lost my father." Nick Uhlig, 34, is a church member who did not go to a service Sunday morning. He said that his cousin, Crystal Holcombe, was at church and died in the shooting. She was eight months pregnant. "Somebody went in and started shooting," he said, shaking his head and taking a long drag on a cigarette. Seven other members of the Holcombe family died in the shooting. Uhlig said Crystal was with her in-laws, Bryan and Karla Holcombe, who also died, according to The New York Times. Three of Crystal's children perished as well. Marc Daniel Holcombe and his infant daughter also died in the shooting, family confirmed to The Washington Post. Bryan Holcombe did prison ministry and would go to the prison with a ukulele and sing for the inmates, Uhlig said. "They had a strong faith, so there's comfort in that," Bryan and Karla Holcombe's daughter Sarah Slavin told the Times. "I feel like my parents, especially my mom, wasn't scared." The church regularly posts videos of its Sunday services on a YouTube channel, raising the possibility that the shooting was captured on video. No video appears on the channel from Sunday, and authorities have not yet said whether they obtained video footage from Sunday's service. In the most recent sermon video, posted Oct. 29, Pomeroy began by speaking in front of a stage with two guitarists and a singer. Most people, including Pomeroy, appear to be in jeans. A few children can be seen walking around and climbing around on the pews. Pomeroy stood behind a podium behind a big Harley mortorcycle. He mentioned Annabelle in his sermon, saying that the two of them rode on the bike that morning. With a smile, he mentioned that while both of them could watch the sunrise and the nature around them, the temperature that morning had fallen nearly to 30 degrees Fahrenheit (-1 degree Celsius). "She was back there cuddled behind me, and when I pointed at the temperature gauge, I felt her snuggle in even tighter," he said. CORRECTION (Nov. 6, 2017, 12:49 p.m. ET): An earlier version of this story misspelled Sheriff Joe Tackitt's name.